Commissioned to build the website and branding, as well as producing a charity video to help raise funds. 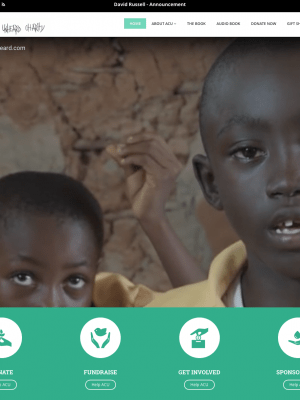 A fully-integrated web and marketing solution for this UK-based children’s charity, including branding, e-commerce, website design and development, fundraising and video production. This is an on-going project for A Child Unheard, with continuous efforts to help raise funding and support for the charity through various marketing methods. We began by helping to develop the branding based on the client’s vision, followed by building a user-friendly website that could be geared towards helping raise funding through public and corporate donations (via JustGiving and through the sale of merchandise through the e-commerce platform). Our team were then commissioned to produce a charity promotion video to help kick-off fundraising efforts in the UK, which helped raise over £15,000 through various sources in under 2 months. Our nationwide Public Relations (PR) efforts helped raise over £31,000 in under 6 months by gaining coverage for two teenagers who signed up to cycle the Silk Road. More details of this campaign can be seen below. We enjoy working closely and continuously with the Management team at ACU to come up with new strategies to help continue delivering results that exceed their expectations. 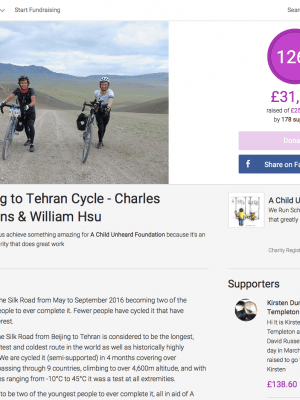 For this particular fundraising campaign, we teamed up with two teenagers who wanted to cycle the Silk Road during their summer break before Uni. 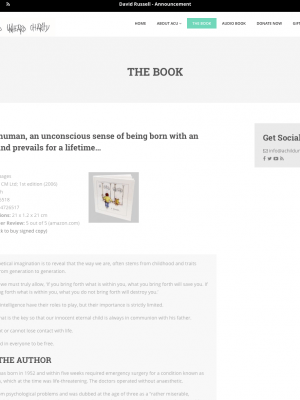 A Child Unheard sponsored the ambitious pair and began the process of PR/marketing nationwide. The campaign yielded 178 JustGiving supporters, combining to raise £31,598 through online donations in under 6 months (128% of the campaign goal). 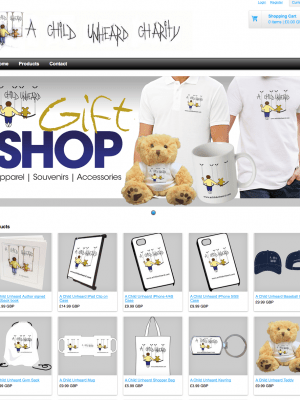 The website was designed and developed so it could be navigated easily, with the main purpose of highlighting the JustGiving donation pages, as well as the various branded merchandise that could be purchased through the website. Thorough A/B testing was conducted for EVERY marketing campaign, including PR, social media ads, PPC and video marketing, ensuring that charity funds were distributed to gain maximum results each time. “Having worked with Deren on a previous web/marketing project for my logistics business, it was an obvious selection process to ask him and his team to help me in developing my charity. Though I had experience and expertise around me to help build the schools and sponsor children through scholarships, I am a complete novice when it comes to the online World. Deren just makes things easy. No technical jargon and fluff, he gets to the point and tells me exactly what needs doing, when it needs doing, results he’d expect, and how much it’s all going to cost. There’s no trying to “read between the lines” or figure out what I need to do next, Deren basically just kept me on track with it all. Once again, really pleased with the effort and diligence shown during this on-going process – we love the website and how easy it is to navigate; we love the video you produced for us in Uganda to help with our fundraising efforts; and we thoroughly appreciate how much of a huge help you are behind-the-scenes helping drive the charity forward with your marketing expertise and confidence.